From the past few days, there have been several rumours about Chiru’s 150th film going on floors in February. This news caught on fire big time when Chiru was seen in a new look at an event today and surprised everyone. 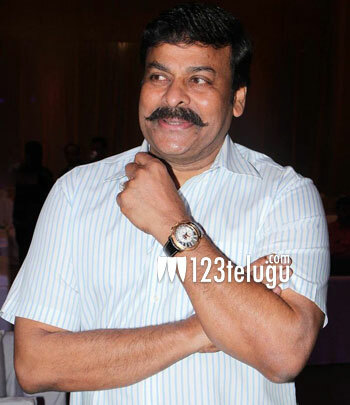 Seen here in the above picture is Chiru sporting a stylish new moustache. It is a known fact that Chiranjeevi will be remaking Vijay’s Kaththi which was directed by Murugadoss in Tamil. What ever be the reason, Chiru’s new look has created enough curiosity among his fans who are eagerly awaiting the release of this much awaited film. V V Vinayak is the director and Ram Chran is the producer of this much awaited project.